Hello everyone...I have been busy with blog re-designs. Several bloggers have asked me to give their blogs a new look. I enjoy designing and it gives me great pleasure when my fellow bloggers are extremely pleased with their new look. I thought I would do a post on some of these and share what I have been up to. I have always given, Infuse With Liz new looks for her blog. She was practically my first friend from RMS. I have designed many headers over the past for Liz. 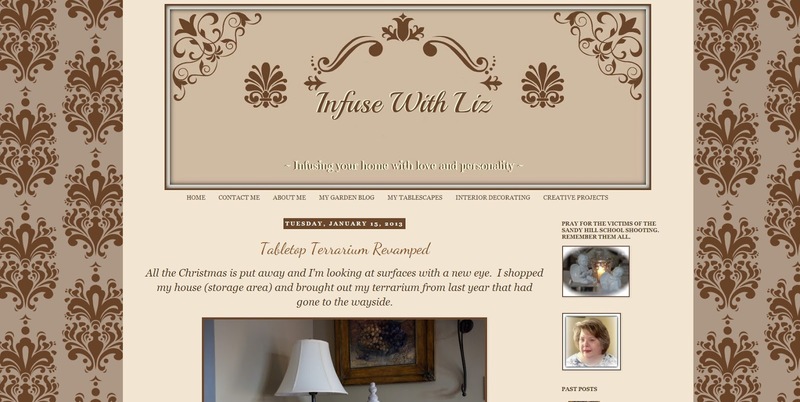 Liz enjoys decorating, tablescapes and gardening. She also has a garden blog....Sit With me in my Garden. Betty, a friend of Liz asked me to build her a blog. I have changed her design several times. Betty has lives in a 2-story Colonial and she is always gardening, redecorating or changing something. Betty is lucky enough to have her lovely home featured in home tours. 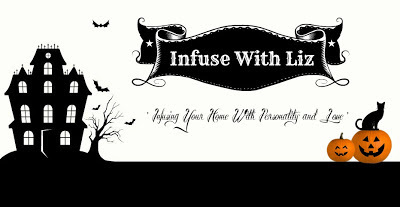 Barbara from Two Birdies and a B. asked me to give her blog a new look. She emailed me during the Thanksgiving holiday. She wanted a Christmas design for her blog. it was ready to go the day after Thanksgiving. Barbara enjoys many things. She also shares recipes, tablescapes. I added the navigation menu, designed her header, added LinkWithin, added some Tablescapes to her navigation menu. I also set up Recipage for her and added some recipes as a guideline, as well as a signature. The whole template was widened. about her design and decided she too, was ready for a new look. She didn't want a background image. Debbie has a huge collection of MacKenzie Child. I love her lovely treasures. Debbie enjoys hiking, kayaking, cross country skiing and snowshoeing in the Adirondack Mountains (thus the name, Mountain Breaths). I also gave Debbie a widened template, custom header, signature, post divider and set up her pages. I set up Recipage for her and also added recipes. I then added some of her tablescapes and gave her instruction on how to add more to each tab. and asked about her blog design. Debbie gave her my contact info. Kitty wanted a new look also. Kitty started her love of cooking when she was in the second grade and received her first cook book. Since then, finding the best recipe has been a passion for Kitty. Cooking for my family is a joy to me. The recipes that she shares through this blog can be passed on to my family and friends, for as we all know--Food=Love! I gave her a widened template, navigation, custom header, signature, pages for her menu and background. set up her recipage and added recipes. So, now you can see how busy I am. I am getting ready to do a tablescape for Girls Wanna Have Fun! Thank you for visiting and enjoy the rest of the week. You are doing some beautiful work~I really enjoyed some the new headers~what talent! You are in high demand! You've done alot of work lately! You know you are my blog angel!I love all the new designs you've come up with. You might say I broke you in!! LOL... Lord knows I've had you do mine over more than once!! Thanks for being so patient and helpful! You're the best! Great work! Each blog design is just beautiful. You have been a busy girl! You've done a wonderful job on all the blogs! I noticed you redesigned yours as well...it looks great. That's a gorgeous picture of you! LOVE each design is just gorgeous!! love them all!! I think you redid my header too, right??? Thank you again!!!!! What beautiful work, Linda! I follow a few of those blogs and noticed the changes! You've done a great job! My, you have been busy! 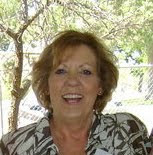 Thank you Linda for being so sweet while helping me with my blog. Great work! I really need to go through them over the weekend. WOW! Wonderful Job, Linda. So nice of you to share your expertise with your friends. P.S. You should make amazing husband do a Guest Post for us. Please, pretty please. It can be about his errands around property... dogs are welcome too. I can see the happiest clients there ;).You are very talented. Lovn' your designs wish you could do something with my plain little "LoblollyLane". It is boring after I see all these great looking blogs. These are some of my favorite blogs! What beautiful new looks you've given them! You are so talented my friend! Very impressive blog layouts - I must re-vamp mine one day. Glad you are Clogging again as well as blogging. good to know a lot is happening here..
Hi Linda...thanks for your visit, and yes I am interested in a change on my blog...email me at ppultorak (at) g mail (dot) com Thanks! You do beautiful work Linda! Each blog is different and impressive. Your work is truly beautiful. You have such a gift. Each design is so unique, you sure know how to pick up on their style and personality. Hi...got your second comment, but never got your email (ppultorak AT gmail DOT com) and yes, I painted the teapots for Entertaining Women!! You do a fantastic work, well done! Beautiful work! I couldn't decide which was the best.. cause they are all so unique! Love them all! I was looking at some of the blogs you have put together, you did some fantastic work as always. I would like to THANK you so much for the one you did for me ! ""tablescapes by diane" I hope you have a wonderful week with your family. Just found you through Two Birds and a B, and found her through Claudia. Actually found you for he second time because I remember seeing you early on in my blogging when I didn't yet know how to save the blogs I wanted to look at in the future. Don't want to lose you again so am putting you on my blogroll where I won't miss new posts. I have 2 precious grand-Schnauzers who come visit me several times a year. They are the smartest things! And they love to be held up in your arms for a Schnauzer hug.